I was looking forward to my anchor-out time at Treasure Island, but after the first three times that I had to re-set the Danforth because it picked up bottom-trash from previous visitors (old rope infused with mud, plastic bags filled with who-knows-what), I thought to rename the cove Trash-ure Island. My efforts turned out to be the entertainment of the afternoon. “Look at that poor noodlehead single-hander, honey,” I imagine they were saying. Later I was hailed by a chartered Adventure Cat 20′ wide Chartered Catamaran wedding party, “Hey Brattleboro!” the father of the bride hollered, “We’re from Bennington!” Demonstrating that even far from my landlocked heartland the letters VT can still inspire enthusiasm from far-from-home Right Coasters. I finally found a spot t hat appeared to be clean and the anchor held. Because there were no boats near me and I was pretty close to the guest dock and beach, I put a stern anchor out as well. Then it was pure bliss for three days. The wind stopped, the Harley Convention went somewhere else, and the air siren at noon on Tuesday was “ONLY A TEST,” as confirmed by a mechanical voice somewhere in the shrubbery. Austin was in good spirits, thanks to the easy twice-a-day trip to the clean beach. 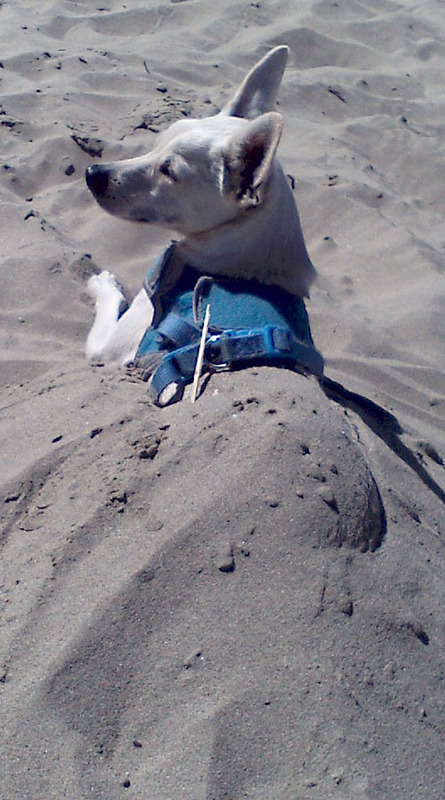 He even let me bury him in the sand until I got to his front paws. 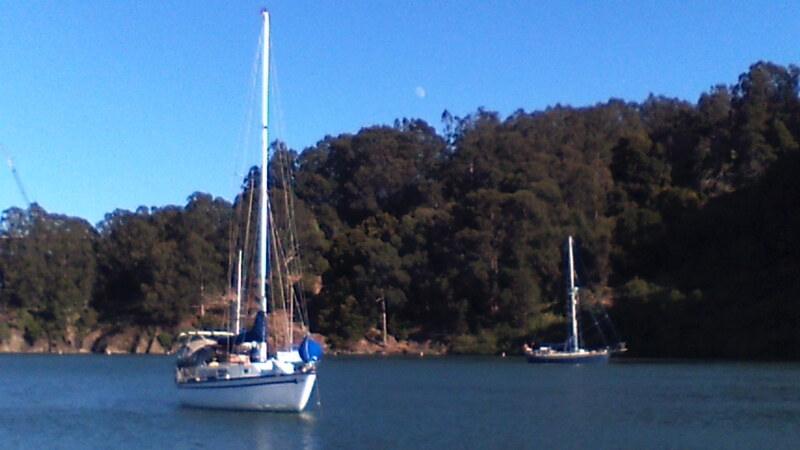 Our trip to Richmond and the hidden jewel of the Point San Pablo Yacht Club was uneventful. We got in after a stop in Berkeley to wash off the mud the stench of which I thought I’d never stop smelling. And yes, I did wash under my nose. 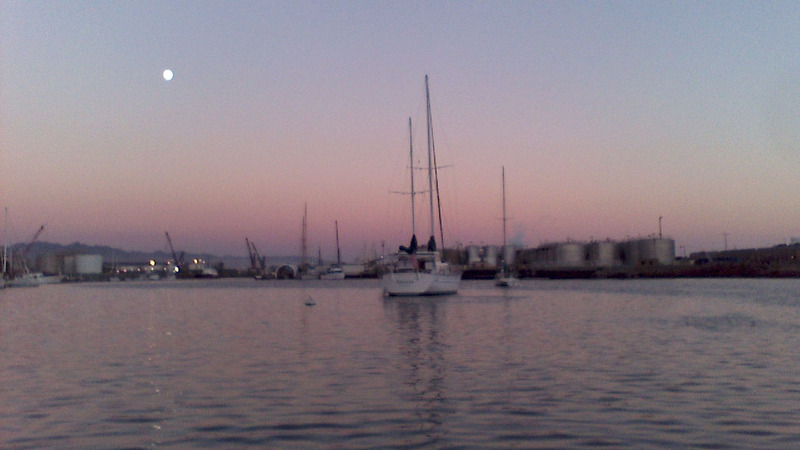 Why am I surprised that the mud of the Petaluma smells just like the mud of Treasure Island? 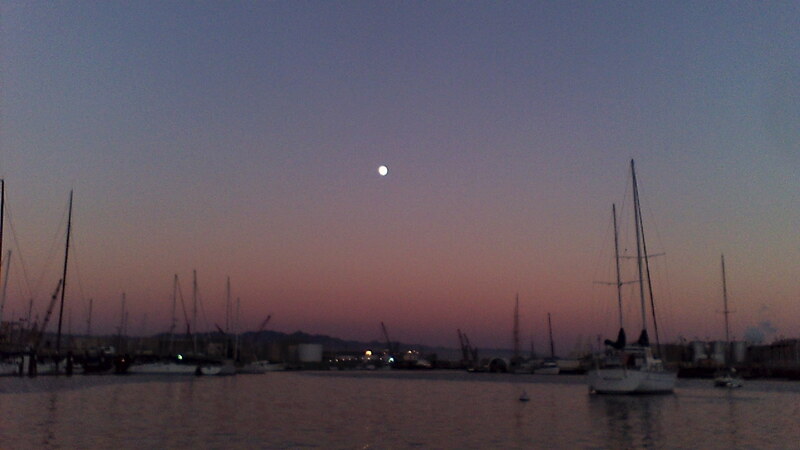 We got in just in time for a beautiful moonrise, calm and clear. And except for the squealing of the train switching yard and noises from KKMI boat yard, it’s a surprisingly peaceful industrial area. Plus, the YC folks are extremely friendly. It turned out to be just the place to continue working on my almost finished first issue of The LiveAboard Docucomic Series, Dock Dorks. This entry was posted on Friday, August 31st, 2012 at 7:59 pm and is filed under Cruising Life, Dogs, Firsts and Trips. You can feed this entry. You can leave a response, or trackback from your own site.